To resume in April 2018. Already it is February, and the birds are astir, especially on days when it is a little warmer. I’ve been hearing Carolina Chickadees singing – not just scolding – and the other night, a Barred Owl calling. The robins don’t seem to be singing yet, although surely it is just a matter of days. Pleasures of the season, and of anticipation. We should all stand up and give a hearty round of applause and recognition to Bob Shipman, who has served as our Manassas-Bull Run Christmas Bird Count Compiler for ten years, and who is now stepping down. Thank you, Bob! for your unflagging energy and organization, and for leaving the Count in better shape than you found it. Phil Silas will be taking over as Compiler. Two upcoming classes: “Birding by Ear Boot Camp,” with Joette Borzik, at the Blue Ridge Environmental Center, Saturday April 28 (click here for more information), and “Bird Behavior,” with Bill Young, a four class, one field trip short course, beginning May 1. (Click here for more information.) Space is limited for both. There is also more information below in this newsletter. If you had not heard, the National Audubon Society, National Geographic, Bird Life International, and the Cornell Lab of Ornithology are partnering in making 2018 “The Year of the Bird,” a campaign to celebrate and support birds, and to raise awareness of the conservation challenges facing them. ASNV is participating in this. More information at http://www.audubon.org/yearofthebird. As a kind of kick off, the National Geographic Society in DC is hosting a program on February 15, from 2 – 5 – “Taking Flight: Bird Migration and Conservation Across Hemispheres.” Click here for more information. ASNV is pleased to announce two new grant programs designed to address habitat concerns and youth education. Conservation Grants: Up to $4,000 is available to fund selected project proposals (Click here for specifics.) that aim to protect or improve habitat for birds, butterflies, other wildlife and/or native plants in the chapter’s territory. Individuals, non-profit organizations and public schools are eligible to apply. Youth Education Grants: $1,500 total is available for projects that help schools and non-profit organizations connect youth to birds. For this inaugural year, all types of requests will be considered: field trips, speaker and admission fees, equipment, transportation, plants, etc. Up to 25% of the grant may be used to cover administrative costs. Further information will be coming shortly. Click here for more information. Join Joette Borzik for a one-day Birding by Ear Boot Camp! We will spend a full day learning bird song in the field on the trails of the Blue Ridge Environmental Center and surrounding area. Some basic birding knowledge is a prerequisite i.e. being able to identify some of the local common birds by sight. Classroom: Tuesdays, May 1, May 8, May 15, and May 22, 2018. 7 – 9 pm. Location TBD. Field Trip: Saturday, May 5, 2018. 8 – 12 noon. Location TBD. Join Greg Butcher for an introduction to waterfowl identification. Get to know some of the many species that winter in the open waters of our region. You’ll learn how to tell a Bufflehead from a Hooded Merganser, and hopefully see the beautiful Tundra Swans that call our area home during the winter! Strategies will include identification by shape and color pattern. The class is given through Prince William County Parks & Recreation. The 36th Annual Manassas-Bull Run Christmas Bird Count on December 17, 2017 was very successful. The day turned progressively warmer as 116 people scoured woods, lakes, fields and ponds counting 88 species (second highest species count ever) and 33,465 birds (highest number ever). Much of the increase in bird count came from lots more American Robins (an all-time high, 50% higher than the previous high count) and European Starlings (not an all-time high, but twice as many as any count since 2003). We did record the Northern Shrike again this year. Also the first Common Golden-eye in 26 years, the first Rough-legged Hawk in 24 years, and the first Mute Swan in 17 years. Seven all-time high sightings were recorded (Gadwall, Red-shouldered Hawk, Yellow-bellied Sapsucker, Northern Flicker, Pileated Woodpecker, American Robin, and White-throated Sparrow). Among the other interesting birds were American Kestrel, Tundra Swan, American Woodcock, Eastern Meadowlark, American Tree, Chipping, Savannah and White-Crowned Sparrows, Merlin, Red-headed Woodpecker (numbers down to 9 from 55 in 2015 and 23 in 2016), Gray Catbird, Palm Warbler and Northern Harrier. Copies of the full results for the count are available here on the Audubon Society of Northern Virginia (ASNV) website, the ASNV office, any of our sector leaders, or the compiler, Bob Shipman. We gratefully thank all the enthusiastic birders both new and returning; we hope you all had a good time and will be back for next year’s count, which will be on Sunday, December 16, 2018. The basic processes of evolution are happening in every generation in every species, but they are almost impossible to observe. They are typically slow and subtle. Legislation moves very quickly in the state legislature. Legislators have introduced almost 4,000 bills this year, on topics ranging from coal ash storage to greenhouse gas emissions to energy efficiency to trees. The General Assembly convened on January 11 and has set a target adjournment date of March 10. At http://virginiageneralassembly.gov/, you can find your legislators, track bills and watch the House and Senate live when they are in session. At the Virginia Public Access Project, www.vpap.org, you can search bills by issue, e.g., natural resources. If you put in the word “trees,” for example, six bills are listed. The Virginia Conservation Network and the Virginia League of Conservation Voters are working hard to advance sound conservation policies and block the problematic ones. To view the updated list of VCN positions, visit vcnva.org/bill-tracker. The Chesapeake Bay Foundation is advocating for several bills designed to save trees and encourage the planting of more trees. According to CBF, five of six bills have been killed as of January 26. The one surviving bill is HB 494, introduced by Delegate Keith Hodges. You can read it here: https://lis.virginia.gov/cgi-bin/legp604.exe?ses=181&typ=bil&val=HB494 . The House of Delegates approved it on a 98 to 0 vote on January 25. Auduboners should urge their state senators to support tree preservation bills. The Virginia Department of Environmental Quality (DEQ) has proposed a state plan to reduce carbon emission from power plants, capping emissions at 30 percent by 2030 and allowing Virginia to trade carbon allowances with other states. You can read about the plan here. DEQ opened the 60-day public comment period on January 8. DEQ also has public hearings around the state scheduled for March, including one at the Woodbridge DEQ office on March 15, 5 p.m., Department of Environmental Quality, Northern Regional Office, 13901 Crown Court, Woodbridge, VA. Read more. For information, contact Karen Sabasteanski. The Virginia Department of Environmental Quality (DEQ) is developing a salt management strategy to ultimately try to reduce the use of salt on pavements as a de-icing agent. “. . . many of the nation’s rivers and streams are becoming saltier,” reported the January 9 Washington Post. Several studies have found that chloride, a component of salt, at certain concentrations can be harmful to aquatic life. A stakeholder group will meet from 1 to 3 p.m. on February 27, 2018, at the Northern Virginia Regional Commission at 3040 Williams Drive, Suite 200, Fairfax.You can learn more here: DEQ contact: Dave Evans: 703-583-3835. If anyone would like to work on this issue, contact Glenda Booth. Tom Nardone leads the walk at this popular winter birding trail through woods along the lake and past open territory as well to get a broad habitat range. Sponsored by Northern Virginia Bird Club. Getting there: Entrance is off Route 123, south of Burke Lake Road. Follow signs to Park, turning left at second traffic light. Take an immediate left in the park, then meet at the lot on the right (near the mini golf course). 7315 Ox Road, Fairfax Station, 22039. Meet at Lake Newport and carpool or caravan to the other Reston lakes, looking for winter waterfowl. Waterfowl are often the highlight of winter birding, when their variety is far greater than for our summer residents. Sponsored by the Reston Association and The Bird Feeder of Reston. Huntley’s marshes and woodlands are great for birding any time of year. Join leaders Tom Nardone and Dixie Sommers on this walk sponsored by the Northern Virginia Bird Club. Getting there: From I-195, take Route 1 south for 3 miles. Turn right on Lockheed Blvd. and in 0.5 miles turn left into park entrance. 3701 Lockheed Blvd. Meet in parking lot. NOTE: First day of Daylight Savings Time! Don't miss out winter waterfowl! Join Dixie Sommers at Mason Neck to scope the water and walk the beach and woods. State fee area. Sponsored by ASNV. Getting there. From I-495, take I-95 South 7 mites to Lorton exit. Go left (east) on Gunston Rd, Rte 242. In 4 miles, turn right into Mason Neck Management Area. Meet at the visitor's center at end of the paved road. 7301 High Point Road, Lorton, VA 22079-4010. Join this walk at a great place for winter birding. We’ll scope the river and walk the woods trail. Led by Dixie Sommers and Tom Nardone. Sponsored by the Northern Virginia Bird Club. Lake Newport may offer some wintering waterfowl and the woods here are good for woodpeckers and kinglets. Sponsored by the Reston Association and The Bird Feeder of Reston. Marc Ribaudo leads today along the lake, through woodland to find the variety of winter species that use this park. Sponsored by the Northern Virginia Bird Club. The lake here is restored and the path around it is easy (a few steps in places) and well maintained. Join leader Jean Tatalias at this new location. Sponsored by the Northern Virginia Bird Club. Getting there: From I-495 take exit to VA-620, Braddock Road going west and continue 2.36 miles. Turn left onto Rt 651 Guinea Road and continue 0.64 miles. Stay straight at intersection with Commonwealth Blvd (do not turn left to follow Guinea Rd.) Go 0.4 mile and turn left on Pommeroy Dr and then turn right at the intersection with Bronte Dr. to the entrance leading to the parking lot. 5216 Pommeroy Dr, Fairfax 22032. Highlights of our Cuban endemic sightings included the Zapata Wren and Cuban (Zapata) Sparrow, the ever-charming Bee Hummingbird, Blue-headed and Gray-fronted Quail Doves, the Cuban Bare-legged Owl, Cuban Solitaire, Oriente Warbler, Cuban Grassquit, Cuban Trogon, Fernandina's Flicker, Cuban Green Woodpecker, and the entertaining, pugnacious, and beloved Cuban Tody. 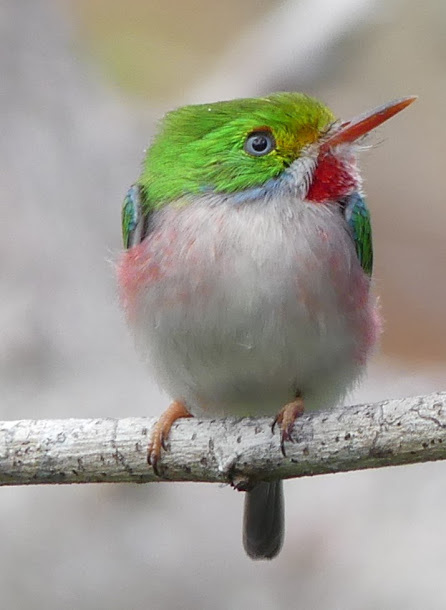 Regional endemics included the Cuban Emerald, Great Lizard-Cuckoo, and Western Spindalis.